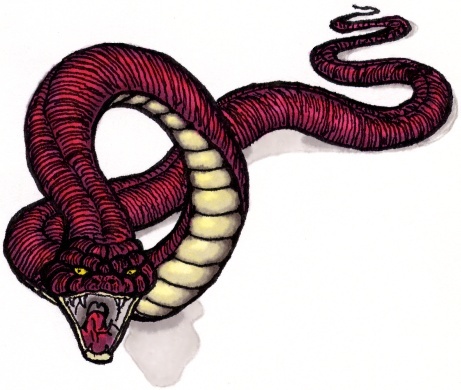 Red serpents are one of two known breeds of serpents known to the Smitemaster's Guild at this time. Serpents are the result of some experimentation done by the Empire to get them to these unnatural sizes. This experimentation increased the size and length of them, meaning that they can grow long enough to fill up a small dungeon. Because of their size, diagonal movement is impossible with any breed of serpent. While both can make for some very tense and deadly situations, each have their own weaknesses to exploit. Red serpents are impenetrable by a standard issue delver's sword. The only way to get rid of them is to trap them in a dead end and let themselves shrink to death. The red serpent's main disadvantage is that it is unable to cross force arrows, allowing a delver to easily find a place of safety while the serpent finds a way to it's death. Blue serpents, also called "Rattleserpents" or derogatorily as "Rattlesnakes", are the most recent breed of serpent that has been discovered. They are almost identical to their red counterpart, but rattleserpents are weak at their tail instead of their head. In order to destroy a rattleserpent, an exterminator must hit the serpent's tail with their sword in order to shorten in. This means that a thirty foot (Six tile long) long snake will require an exterminator to hit the serpent's tail a total of five times in order to kill it. If a rattleserpent gets trapped in a dead end, then it remains stationary. When first discovered, it was believed that breeds of serpents moved very randomly. Only recently has the Guild started to accept theories that claim there is a specific pattern to their movement that involve them changing directions after certain multiples of moves. This makes it much easier to predict a serpent's moves and is elaborated on below. Diagonal movement by a delver was, at one point, critical in its sucessful removal from a dungeon, but Orthagonal Squares have recently put delvers on the same field as a snake. When that happens, the best thing to do is to try to stay the same amount of moves away from the serpent's head as possible as you try to lead it into a corner. The movement algorithm for both of these serpents, and adders, is the same and none of them can move diagonally. (Differences in behaviour are described later). The serpent first checks to see if the player is directly in front of or behind its head. If he is, the serpent continues moving in that direction. by one tile if they are blocked in all four directions. Rattleserpents can also move over Scrolls and Force Arrows (providing the arrow does not block the direction). If their tail moves onto a sword after movement, then it is automatically stabbed. A brain directs a serpent in the same way that it directs a roach, except at any given time the brain ranks only the three plausible moves; the serpent then tries these moves until it finds one that it can do, otherwise it shrinks. If the brain cannot find a path from the serpent's head to the player, the serpent moves as unbrained, but note that this path is determined by the path map and thus does not account for the fact that serpents cannot move diagonally. Another consequence of brain-pathmapping is that rattleserpents (and adders) will not go over arrows or scrolls if there is an available path-map to the player.